What: Presentation on Healing Waters Lodge and Lewis & Clark Expeditions, offering a variety of fly fishing vacation packages, including fly fishing schools, with guided fly fishing for rainbow and brown trout on southwest Montana’s major rivers: Beaverhead, Big Hole, Jefferson, Madison and Ruby; and, access to miles of private water offering quiet streams and cooperative feeding fish. Our full time Chefs bring flavor, health and an ample amount of creativity to each meal. Clean, comfortable guest rooms offer two queen-sized beds, private bath, wireless internet, and a view. 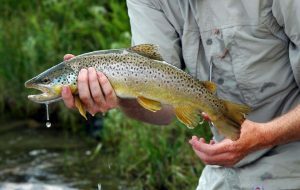 We also offer 5-day/4-night float trips down the Smith River. When: November 18, at 11:00 a.m.
For more information contact: Jason at Orvis Bellevue at 425-452-9138 or Mike Geary at Healing Waters Lodge at 406-459-2030.